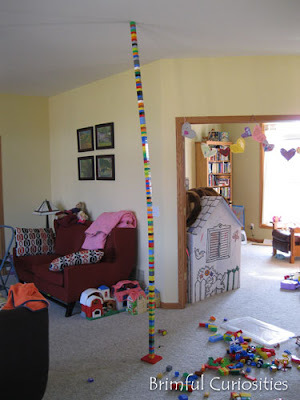 The little (and big) architects in our home worked hard to build a tower all the way to the ceiling. We quickly learned that that plastic blocks are ever so slightly hazardous when falling from great heights. Luckily, no Brimfuls were hurt in the making of the tower. I'm not positive, but I think that Chile holds the record for the world's largest Lego tower with a version built last year that stands 30.94 meters (102 feet) tall! My daughter LOVES to build big duplo towers like that! I don't think she's made it all the way to the ceiling though. That's crazy high! My boy's like to build towers too. Very impressive! I can't say we've ever even gotten close to the ceiling! My grandson loves to build with legos and blocks. It's an engineer gift, I think. Anyways, your post inspired me to write a music article about the building blocks of music... so thank you! Fun! My daughter loves to build towers too. She uses Tinkertoys! Wow wow wow! I don't think I'm going to let me girls see this - otherwise they won't make it to bed tonight! That's pretty tall! Not sure we could do this. Wow, that's pretty amazing that the blocks reached up that high without tumbling over. Pretty cool!